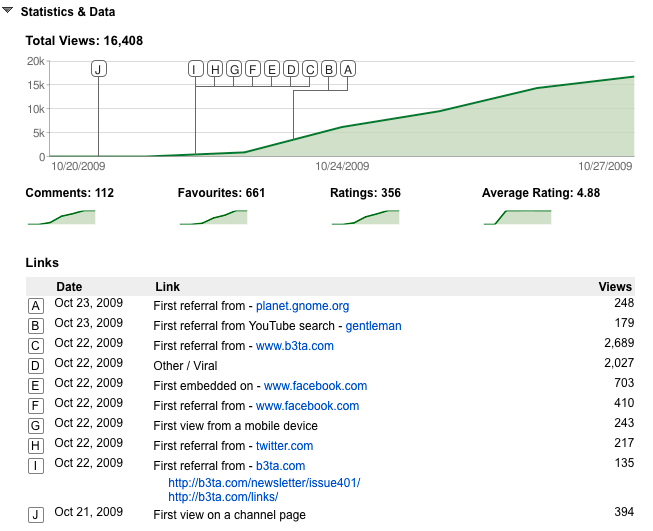 In addition to the existing statistics page (including awards and demographics), this interface now shows a chronology of the video’s popularity. In the case of Mr. B, the link first appears on b3ta, then @DJYodaUK and a few other twitter users, followed by Facebook, more b3ta, and then Planet Gnome. For the first time I feel like I have a clear, concise view of how a piece of content went viral. Take as a counter-example a popular video from this week, The Cat That Betrayed His Girlfriend whose popularity seems to have existed before the video was on the site (its first source of traffic was searches for the title). Browsing around a bit, it seems as though most big videos get their start from external sources, related videos, and searches. This feels like a secret view into the inner workings of the internet, but all the pieces are still scattered around. I guess Youtube is the only one that can put them together. The long-form article summarization service Brijit decided to close its doors today. It would appear that their business model (paying people to summarize long-form news articles) was not viable. I may be in the minority, but I used the tool as a clipping service, subscribing to feeds of articles about the industry (Facebook, Social Networks, etc.). I’m really sad to see it go; it was one of the only tools I actually used on a regular basis. You can still get access to their archives. Orkut to take over MySpace? Alexa has recently been improving the global coverage of their traffic statistics. Their Global 500 now shows a number of sites that have almost zero attention in the US market (e.g. Baidu, QQ, and Yahoo Japan). Many on this list had a negligible presence on Alexa a year ago, most likely due to their marketing of the Alexa Toolbar in foreign markets. Orkut gets no attention in the US market mainly because their US presence is tiny compared to Facebook, MySpace or even Friendster. If they take the number one spot worldwide, will Americans respond? Google paid $900M to be MySpace’s search provider, a partnership that might lead people to believe that their business interest in social networking was diminishing. Another explanation could be their interest in monetizing a mature social networking service while Orkut continues to grow. As the service continues to drive traffic globally, it is inevitable that the press will take notice, and Google can take this opportunity to grow their domestic user base. I hadn’t logged in to Orkut for years, but upon returning I realized that very little has changed. Same strange photos, same hearts and ice cubes, same periwinkle-and-purple color scheme. Orkut’s growth reinforces the fact that the value of social networking services, and social software in general, comes from the base of active users, not the set of features they offer. Rabois: One of the things we’re doing is transcending the traditional value propositions of LinkedIn. Historically we’ve been focused a lot on hiring, recruiting, and finding new jobs and opportunities. We’re going to be using LinkedIn exploring new opportunities for people to conduct research, business research. One of the most important uses of a professional network is to get intelligence and get business information. For example, if one wanted to know what three changes are going to occur in patent law in the next five years, LinkedIn is a perfect tool to find that answer. Or, what venture capitalists are most appropriate for investing in a sports medical device. So we’re going to have a LinkedIn answers. You can sort of envision a useful version of Yahoo! Answers tied to people’s professional credentials and profile so you can assess the validity and credability of people’s answers. Francisco: And how do you get the incentives? How do you provide incentives for people to actively participate in that? Rabois: Principly social capital. It’s going to work within two degrees, and that means a friend of a friend. So if someone I know is asking a question and I know the possible answer, I’ll be willing to respond because I know the person in common. So I’ll earn some social capital as well as develop a professional set of expertise and reputational devices on our site that allow you to market yourself as an expert in a particular topic. Answer sites have been coming out of the woodwork lately; after the overwhelming success of Naver and others in Asia, Yahoo! Answers opened a free, public question/answer site in America. Microsoft followed shortly afterward with Live Q&A and then Amazon with Askville. Each of these sites has a slightly different take on the incentives and social dynamics that make up the system, and each hoping to find the magic arrangement that creates high-quality content for its users. Of course the holy grail for these services is to achieve what Naver did, namely gaining the #1 search market share for search a year after launching their Q/A product. LinkedIn presents an interesting player in this game, specifically because they have a substantial amount of information about their users, and because these profiles represent serious, professional concerns. Their opinion of Yahoo! Answers is obvious (“imagine a useful version of Yahoo! Answers…”), and they believe the users of LinkedIn will participate in something much more serious than the current competition. The interview does not mention when they plan to launch the system, but I would expect it to be soon if the head of BD is talking to MarketWatch. In this case, I share interest in the bands ESG, TV on the radio, et al. with this user, so our compatibility is high. When I share more popular artists like Miles Davis or Bob Dylan, my compatibility score is lower. This makes sense since rarer bands suggest a closer connection. Last.fm has added a similar feature called Taste-o-meter. What’s interesting about these examples is not the algorithm, some augmented form of collaborative filtering, but rather in the way that the algorithm explains itself to the user. Many years ago, with the likes of Firefly and CDNow showing off the power of recommender systems, this sort of behavior would have been considered crazy. Showing to users elements of how your algorithm works? What if they reverse engineer it and copy your methods and copy your system and steal all your users?! Not likely. For most intents and purposes, recommender systems are within wiggling distance of each other. Netflix is holding a contest to see if theirs can be improved, offering a cool $1M to anyone who can show a 10% gain over their current algorithm. While the current leaderboard shows the best contenders at a 4% gain over the original algorithm, Netflix does not expect people to make the 10% gain necessary anytime soon, suggesting the contest could run until 2011. But companies like Amazon and iLike are making improvements through the way that these algorithms are explained. Explanation creates understanding, and understanding leads to trust. What if all systems started to take this approach? We mostly assume that search providers keep their ranking algorithms in a 6-foot safe behind a wall of lasers, but at the same time Google is starting to release more information about PageRank through various systems. Someday we might have search results that explain themselves, while keeping the special sauce away from SEO geeks and spammers. Imagine if a top search result said “This result is first because: your search term was in the title, the author is a well known writer, and the host is a reputable newspaper.” I would probably say “that makes sense,” and in turn I would trust that system even more. As a valued Amazon customer, you’ve been specially picked to get an early look at a new website called Askville where you can ask any question on any topic and get real answers from real people. It’s new, and best of all, it’s free! This site will compete with Yahoo! Answers and Microsoft Q&A in the free question-answering space except that it might be able to leverage the Amazon community of experts. For those that have not been following this area, these systems enable knowledge creation by allowing users ask questions that are then answered by other users in exchange for reputation within the system. The first success in this space was a startup in Korea named Naver that took control of the search market share in a very short period of time. Probably the most significant change is the flow of the question/answering exchange. In Yahoo! Answers, and elsewhere, answers are shown publicly as they are received; in Askville, answers are hidden to the public until 5 answers have been received. Any discussion or clarification can happen in a public message board attached to the question. After 5 answers have been collected, the group of asker and answerers vote and the whole thing is made public. Askville rewards users with “coins,” a virtual currency that will be redeemable in another community named Questville slated for release in early 2007. The system has given me 25 invitations for other accounts. If you’re interested in trying out the system, shoot me an email. What you find inside this little hidden window is usually not startling: MySpace profiles, i-am-bored.com, and so on. But in some cases the backlinks are more interesting. Take for instance the popular Treadmills video by Ok Go is apparently the most downloaded music video of all time. In YouTube’s backlinks we find the largest driver of traffic to be a weblog named fugufish, with over 200k links. Who is this mysterious blogger? Were they the first people to identify the video, or simply a maven that brought it to a larger audience? For a researcher of diffusion (such as myself), these links are fascinating, and start allowing us to understand how giant internet memes tend to spread. This move also continues to solidify YouTube’s place in the ever-evolving media ecology of the web. It solidifies the video site as a platform integrated with other media providers. You can think of this feature as a sort of traffic-share with those sites that drive the most viewership; just as AdSense shares Google’s ad revenue with publishers who use the ads, YouTube will now reward bloggers with traffic for using YouTube as their video platform. YouTube was a pioneer in the platform approach to building an audience, and they continue to innovate.